This has obvious value all on its own, increasing the quality of your draws. The more you have, the more OP each unit you draw for the rest of the game becomes. The first synergy you think to take further advantage is card draw: The more cards you draw, the more inspiration you cause. Wisdom of the Elders, Strategize, Wanted Poster, and Smuggler's Stash all shine here. Card draw that comes on creatures does double duty. 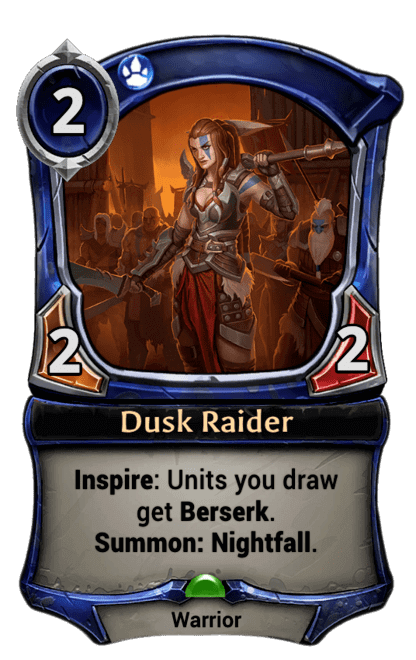 And then there's Second Sight, a card that deserves an article all to itself. When you're not just drawing units, but re-drawing them, you get to inspire them twice. Cards like Meditation, Nesting Avisaur, and the absurd Alhed, Mount Breaker don't draw but do put cards on top of your deck. 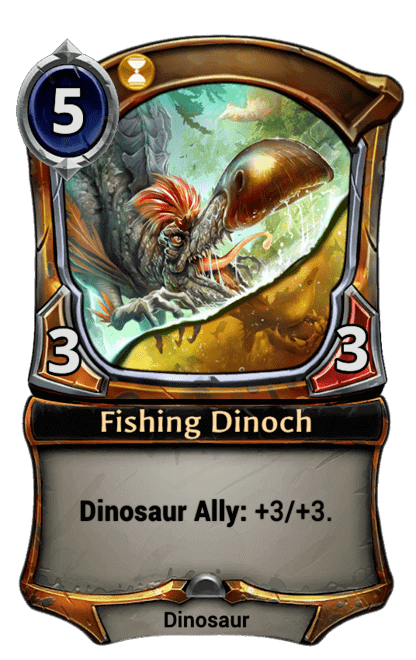 You can also inspire more by playing echo units like Twinbrood Sauropod. That's all just going for volume. What if you want to build a specific monster? Grant berserk to your Reliquary Raider or Worldbearer Behemoth to get more attack triggers. Grant deadly to your quickdraw unit or quickdraw to your deadly unit—or maybe both to all your units—to make blocking your team futile. Get in a quick hit with your absurd attacker via charge. Sometimes, you're not even all that particular what skills your units get, and just count them on getting enough good ones to be absurd. Crown of Possibilities and Breeze Dancer grant whatever, and Caiphus, Wandering King takes whatever. Tranquil Scholar does both. Silverwing Familiar isn't random, but comes with three skills you can start adding on to. You'll never get a random skill that you already have, so you know you'll always get something new. I can't say you'll always get something useful, because destiny does nothing on a unit you're not drawing, and reckless is strictly downside. You'll usually see this strategy alongside echo cards or graveyard recursion, maybe bounce. Inspire is exciting because you usually don't know what you're going to draw or how often it'll trigger. It's enticing because you get to create your own unique and over-sized monsters. It's engaging because there are so many cards to combo with it, attacking the challenge from multiple vectors. And yet, it's also elegant and works just fine without any special effort. I would change nothing about inspire. Now does seem like a good time to examine an inconsistency in Eternal nomenclature. When you see a colon on an Eternal card, it represents a triggered ability. The word on the left is bold and describes the trigger: summon means it's an ETB effect; ultimate means it will only happen once; ally means it happens once as soon as you control another unit of the specified type; inspire means it happens when you draw a card; and some influence symbols means it happens as long as you have that much influence. Some of those spell out the trigger conditions, and some don't. Some aren't even triggers but thresholds. Summon doesn't need to spell itself out, because it and entomb are basically the game's evergreen triggers (though that's pretty relative for a 4-set game that hasn't retired any keywords yet). 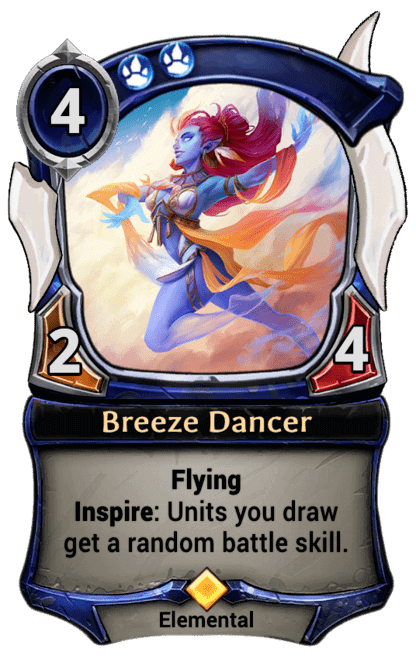 Ultimate clearly does have to spell itself out, because it's trigger (sometimes an activated ability) is unique per card. Ally doesn't spell out its trigger, but is super intuitive. 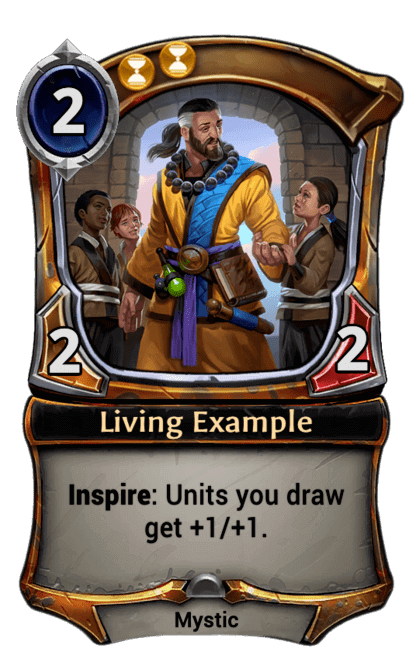 So why then is it that inspire does spell itself out where a very similar skill like empower does not? Let's consider the alternatives. 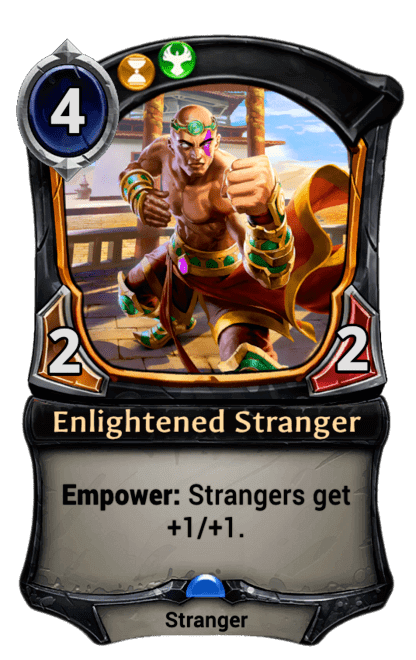 If Empower was spelled out, Enlightened Stranger would read "Empower: Whenever you play a power card, Strangers get +1/+1." That's about double the text length. If Inspire weren't spelled out, Living Example would read "Inspire: +1/+1." It's nice how short that is, and how it lines up with the templating on ally, but maybe that's the problem right there. Despite the game requiring players to understand every keyword (supported by the ability to rollover and reacquaint yourself with it), players were likely misreading inspire, expecting it to grant the quality at hand to the card with the inspire ability rather than the card drawn. It's also possible that more complicated inspire abilities like Alhed's and Journey Guide's had to be spelled out anyhow and Dire Wolf decided to keep consistent with them. So what's the cost of templating that varies by keyword? In a game like paper Magic, it's significant because it's up to the players to interpret the cards and rules and to enforce gameplay correctly. Digital games enforce rules automatically, so that concern drops away. 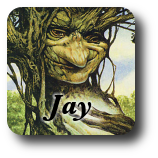 Magic Online still has the complication that the game engine must interpret the cards and rules as written, where Eternal never tries to get the wording exactly right on the cards, instead implementing the intended functionality on the back-end. That's annoying when learning the game, but makes it a touch easier to justify clarity tweaks like this one. Net win? I think so. It's fairly incremental, but a win is a win. This is definitely an example of an advantage digital-only games have over magic et al. It's nice to be able to decide what a card does, then explain that in largely whatever text you want. That doesn't absolve designers of all responsibility though. Players need to be able to extrapolate interactions before they do something (doubly so since there's no take-backs in digital) so the interactions still need to be clear and described somewhere. Hearthstone for example has a distinction between play, summon, and cast. Those distinctions don't always matter, but they are consistently used so players can accurately predict what happens. Yeah. This is an area where I don't love all the choices Dire Wolf has made. There is NO official source of rules or an explanation of interactions. Eternal leans heavily on the just-try-it video game model, and while I support learn-by-playing, there always needs to be a document people can reference when they need to. I've played probably 1000 games of Eternal, and I'm still being caught off-guard by strange interactions. There's a strange rule that says any skills on a relic weapon you've got also apply to spells you cast. That currently only matters for deadly, overwhelm, and lifeforce, but it's a large enough factor that they put those skills on only the most expensive relic weapons. It would be awkward to inspire units and weapons but not relic weapons. And there's a small matter of control. It's one thing to to play a bunch of Lethrai Target Callers and Cat Burglars in hopes of drawing the latter while you control the former; it's another thing to play your deadly units out until your Lethrai Target Caller upgrades a weapon you draw and you play it on your Cat Burglar who attacks immediately. It's a bit of a shame, but not hard to understand.